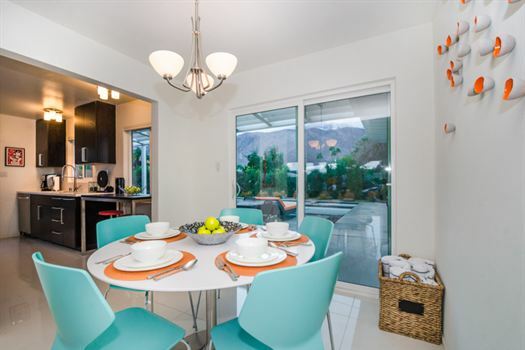 NEW LSITING - While overlooking the San Jacinto Mountains, enjoy your spectacular outdoor living space which includes lounge, pool, hot tub and dining areas. 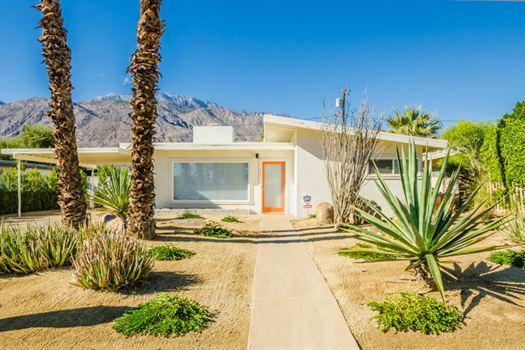 This newly remodeled, classic mid-century, 3 bedroom, 3 bath, bungalow is the perfect desert getaway - in the heart of central Palm Springs. 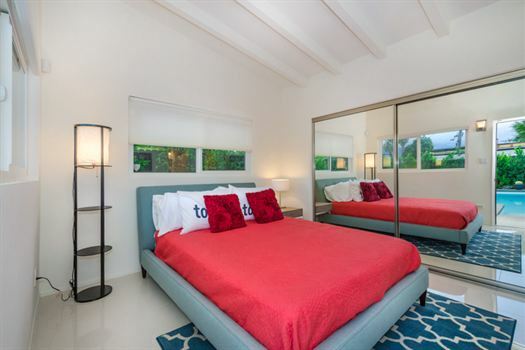 The main house offers two designer decorated bedrooms and are conveniently situated at separate sides of the house - allowing for the utmost privacy for vacationing couples. 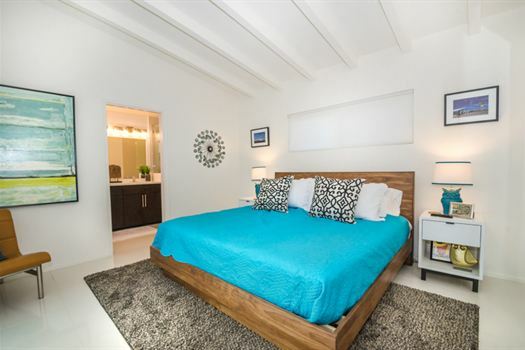 The Master Suite has a King size bed with luxury ensuite bathroom, overlooking the swimming pool, while the second bedroom features a Queen size bed with views of palm trees and desert scape. 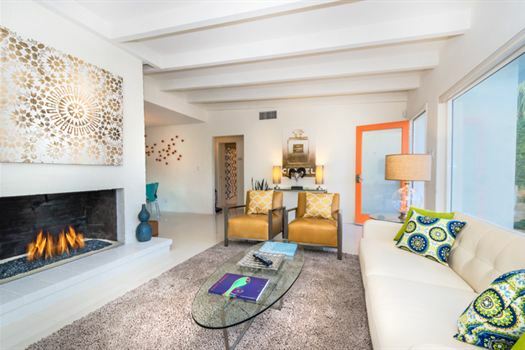 The attached Casita Suite is a poolside cottage, overlooking the southern-facing pool and San Jacinto Mountains, featuring a Queen sized bed with ensuite and private entrance. 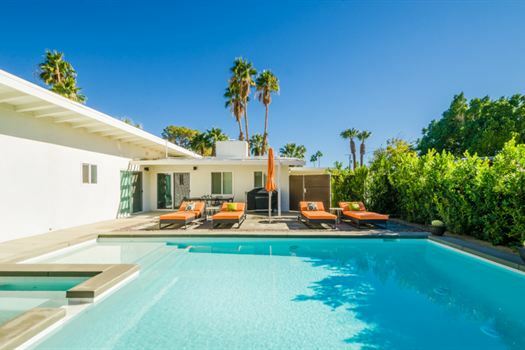 The home features seamless outdoor access, a sparkling pool and hot tub overlooking the lush dessert landscape and magnificent San Jacinto Mountains, the home offers all the privacy you desire. The De Anza Modern is located in Movie Colony East, nestled perfectly between Alexander, Krisel, and Meislman designed homes, has tons of personality, as it's been professionally decorated with premium outdoor furnishings by JANUS et Cie. You'll also enjoy the home's veranda, perfect for grilling, dining alfresco, and watching the reflection of the sunset on top of the San Jacinto Mountains. 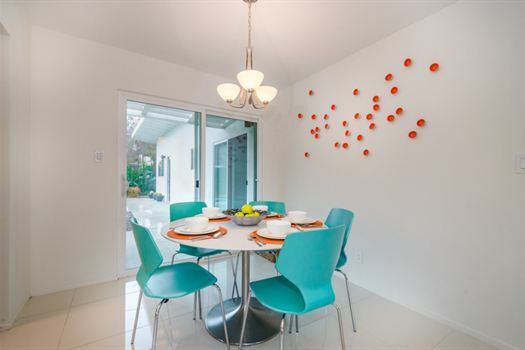 Inside the house, you'll be surrounded by spectacular mid-century modern decor along with the conveniences of home. No detail is overlooked in this home, as evidenced by the high ceilings with wood beams, white porcelain tile flooring throughout, and original brick accent walls. 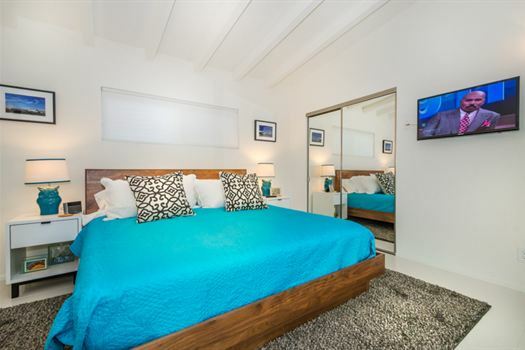 All bedrooms are appointed with luxury linen, a flat screen HDTV and DVD player. 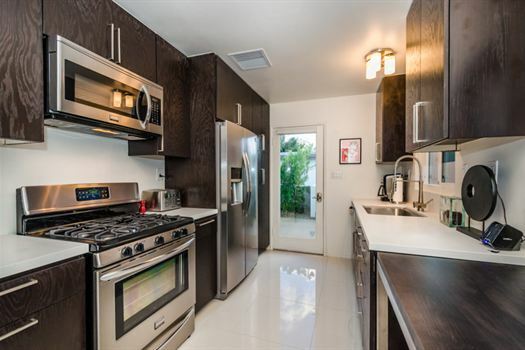 Whip up a meal in the newly renovated kitchen, which has stainless steel appliances, wenge cabinets, granite countertops, host inspired cookware and dinnerware. 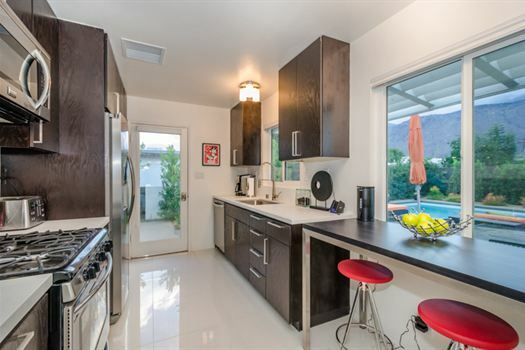 The De Anza Modern home has unobstructed views of the San Jacinto Mountains, and is centrally located blocks from Downtown Palm Springs, an area filled with diverse entertainment, delectable restaurants and multiple shopping selections. Movie Colony East also offers unique activities for leisure within the neighborhood for those wanting to stay close to home, including the popular Ruth Hardy Park. Unparalleled resort-style living with the privacy you deserve. 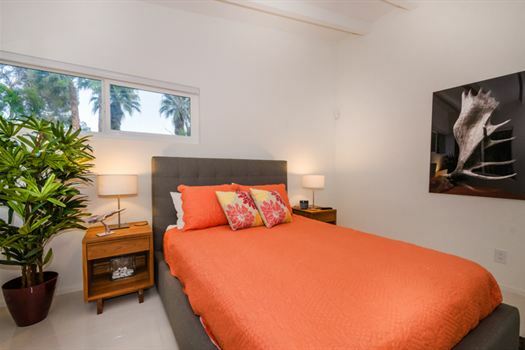 The De Anza Modern home is well situated just minutes from Palm Springs attractions including, downtown Palm Springs, Ruth Hardy Park, The Palm Springs Aerial tram, Knott's Soak City Waterpark, Palm Springs Outlet Mall, and Palm Springs Airport. 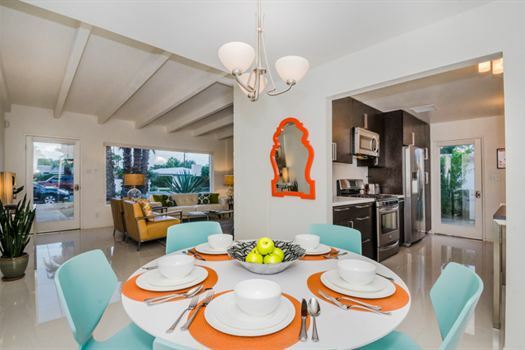 We found De Anza Modern / Oasis Rentals through our search for dog-friendly rentals in Palm Springs and loved everything we saw in the photos. We were thrilled with the place from the moment we walked in and thought the house was even better than the photos depicted. It's both a cute house (very nicely decorated) and comfortable at the same time - and that's a good thing since we were unlucky with the weather so spent more time indoors than we thought we would. Even on a grey day, the house still seemed to fill with light. The house was stocked with all that we needed and Chris at Oasis Rentals responded immediately to our text the first morning with a question about the wifi (which was even faster than our wifi at home). Both a gardener and a pool cleaner showed up the next morning after a big storm that left palm fronds strewn all over the yard and in the pool and put everything back into picture perfect shape....that was really impressive and gives you some idea about what a well-maintained rental it is. To make this a balanced review we thought hard about 'cons' and could only come up with the fact that the heater in the house was really loud, but we expect that 99% of guests will never need to use the heater. Finally, - and equally important - the location was also fabulous. It's a great neighborhood and we could easily walk into town and to Ruth Hardy Park. We hope to come back and stay again soon. We spend 10 very relaxing days at the De Anza house. House is comfortable, well decorated, perfect location. Management team was very attentive and prompt in communication. This was the perfect place! 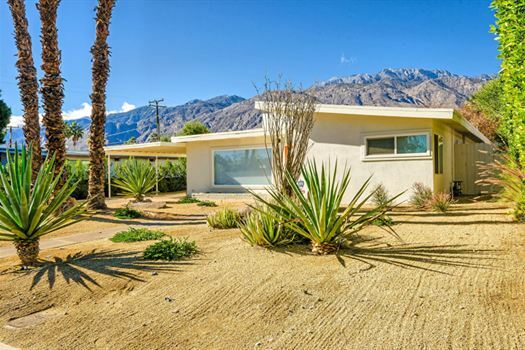 This was the perfect place for our annual Palm Springs retreat. My friend and I had plenty of space for ourselves in each bedroom and had our own large bathrooms. The pool is so inviting and I loved the view of the mountains as I floated in the pool. The house was well equipped for cooking which we did almost every night. We arrived a bit late and Claudia made it so welcoming by going over and turning on the lights and television so we didn't arrive to a dark house at 10 pm. We had a few questions during our stay and Claudia promptly returned texts with solutions. This was a quiet neighborhood and within walking distance of at least two famous homes...one being Frank Sinatra's! I would definitely stay here again and recommend to friends. 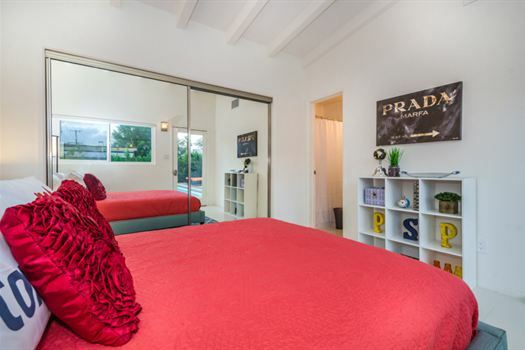 5 of us girls rented Claudias, De 'Anza home ,2 minutes uber ride ,outside of downtown Palm Springs ,to celebrate my clean bill of health ,after what's been an unexpected struggle with breast cancer at 36. The house was better than we imagined! The pictures we thought were great, but once we arrived we were even more excited for the coming days. We comfortably slept all 5 of us no problem and the beds were just that, COMFORTABLE! We each picked a meal to be responsible for during our stay, so we really didn't leave the house much, and found we really didn't want to. However downtown is but 2 minutes ride away so the option was there. Literally felt like our own home for 4 days as Claudia has it stocked not just with the bare minimum so many AirBnb and other Rentals do, but everything you'd find if you were staying over at an aunt or best friends house. FULL kitchen, and I mean everything , even down to little shampoos and conditioners if you forgot yours. We had such a great and relaxing stay we've decided to make it an annual thing. The only part we found difficult was going home and back to reality !! 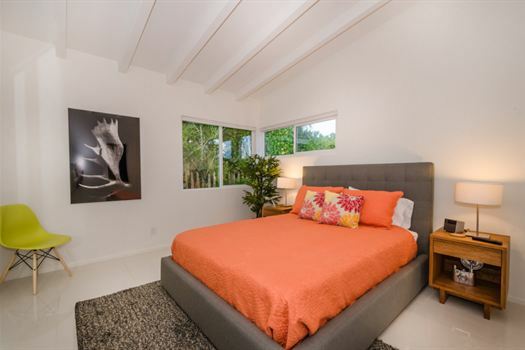 De Anza Modern was a great choice !! I always am a little nervous when choosing our vacation rentals . You just never know for sure that the place is going to be what you are expecting it to be until you arrive . From the minute we pulled into the driveway all my worries disappeared. The house is exactly as pictured and described . It is so adorable ... 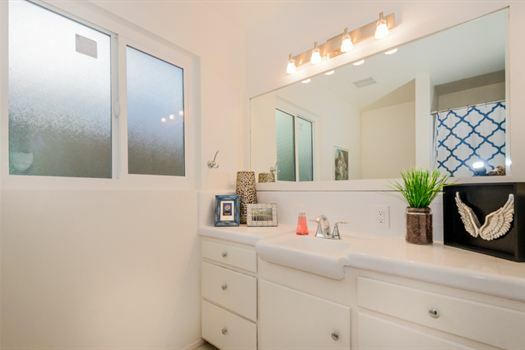 Very clean , bright , and inviting . The beds are amazingly comfortable and the furniture in the living room is very cozy as well . 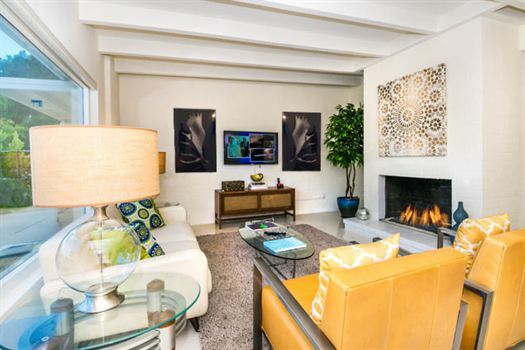 The fireplace is lovely and was great to have to take the chill off in the mornings as we sat on the couch drinking our coffee while watching the beautiful Palm Spring sunrise each day. The kitchen is well stocked and the outdoor grill is FANTASTIC!!! 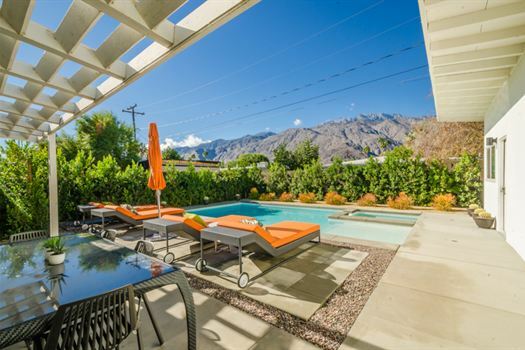 The view out the back windows is so breathtaking and the pool is just right for enjoying the Palm Spring weather . The outdoor loungers are very comfortable and easy to move around if needed . The unbella is very easy to use and gives lovely shade when needed . 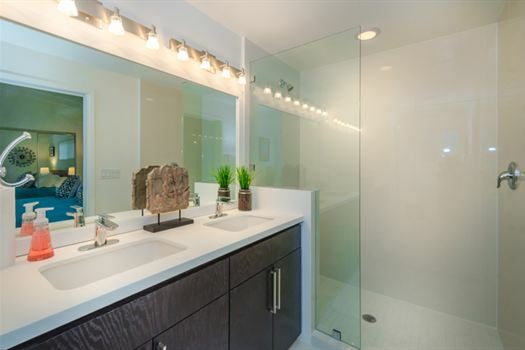 I highly recommend De Anza Modern and Michael and his staff are very accommodating and very good at what they do . The house is very beautiful - pics are very accurate. Feels like it is recently remodeled. Checkin was easy even though we arrived late. Great location - 5 min drive or 20 min walk to the center. Highly recommended. I'd go back! We stayed in this newly renovated bungalow for 9 night. 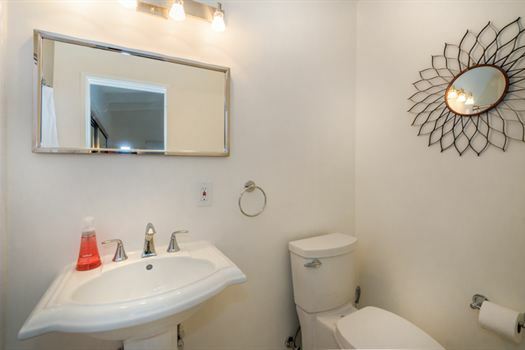 The place is conveniently located relative to the airport in a quiet residential area. 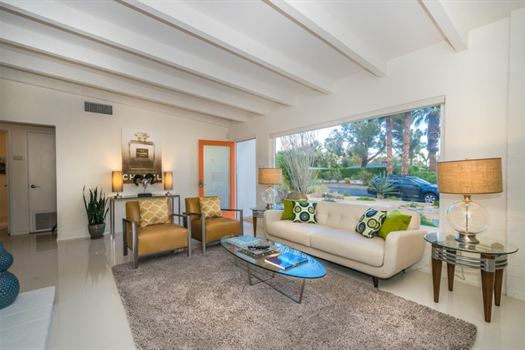 It is short drive to downtown Palm Springs. The facility is well equipped, especially the kitchen. Claudia was very responsive to our text messages to resolve some minor issues. We had wonderful vacation and would heartily recommend it.